SHILLONG: – Meghalaya Chief Minister Conrad Sangma’s office has ‘seriously’ gone green. He asked his staff to make an earnest effort to build a plastic-free environment. All the CM’s stationery and letterheads will be made from recycled paper. 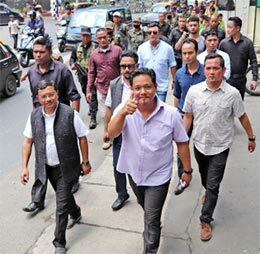 Sangma, a self-proclaimed environmentalist, walked six kilometres from his residence at 3rd Mile Upper Shillong to the State Central Library to celebrate the World Environment Day. “We have to focus on three R’s: reuse, recycle and reduce. I have reduced my carbon footprint by saving at least three litres of petrol by walking today and we are also recycling paper,” he told a gathering comprising officials and school students. The Chief Minister stated that in the past few months, he had asked officials to make his chamber plastic-free. Now the target is to make the Secretariat plastic-free. Under the plan, all government offices will be freed from the use of plastic. Sangma said that all his stationery items and letterheads would come from recycled paper henceforth. Waste paper from the Secretariat is being recycled for this purpose. “I have also asked officials to use renewable energy in my office chamber. This will be done in the next three months,” Sangma said. The Chief Minister expressed the hope that the Secretariat, government offices, schools and colleges in the State would use renewable energy like solar and wind energy in the near future. “Government offices remain closed on Saturdays and Sundays. So the power that is saved can be sent back to the grid, which may help light up a village for a day or two,” the Chief Minister stated. Meanwhile, the Government launched an ‘Adopt-one-tree’ programme in which every citizen would be encouraged to adopt a tree and nurture it.